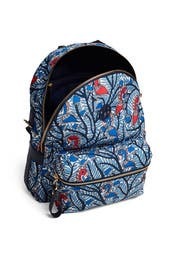 A tropical take on the classic backpack, this Tory Burch style is ready for sunny adventures. 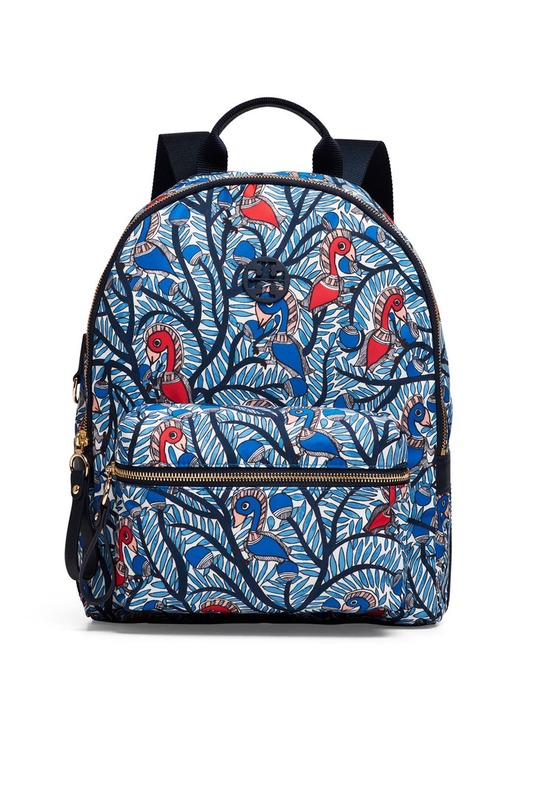 Blue toucan printed nylon backpack with front zipper compartment and top zipper closure. Adjustable webbing straps. One interior zipper and slip pocket. 15"H x 11.35"L x 4.7"D.
I love this backpack. I used it for work and weekend - was surprised I could fit so much in it (spin shoes, a water bottle, folders) because it doesn't look like a full size backpack. The pattern is really fun and reminds me of a more sophisticated take on a Vera Bradley backpack. I got so many compliments and wish I could buy it! Beautiful silky fabric. Really fun "conversation piece" print. It's not quiet big enough to fit my Macbook Pro, so I couldn't use for a work bag.